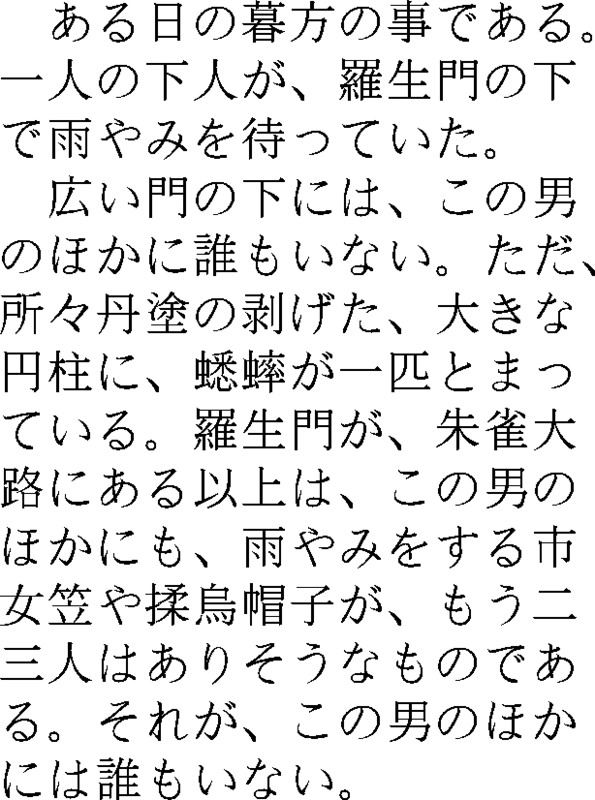 To use Omega to typeset japanese text, just do the following (I assume you are on a UNIX machine, with perl5.6.0 or later, connected to the Internet). And adapt sample-article.tex or sample-book.tex to suit your needs. These file may be compiled and viewed as follows (remember to use odvips and not dvips). An OTP is a program (either in a dedicated language (internal OTP) or in your favorite language (external OTP)) that transforms a stream of characters, for instance, to change their encoding, to add ligatures, or to add various information between the characters. We shall use them to remove unneeded spaces and tell Omega where it is allowed to break the lines. and Omega reads and executes the OCP. This first OTP will be called before Omega does anything. The other OTPs will be called after it has done most of its work. In the following example, we define an OCP list composed of three OTPs (one of them is even an external OTP). We must then use this OCP list. For debugging purposes, I use the following OTP. Do not forget to make it executable. We have already seen how to put it into an OCP list. Internal OTP are OTPs written in a dedicated language and directly interpreted by Omega. An OTP file starts with the two following lines, saying that the input and the output are made up of 2-byte characters. We can then define character classes, such as "spaces", "letters", "punctuation", or anything we may need. Then, we have a list of expressions. So far, we have just taken characters from the input stream and sent other characters to the output stream. But we sometimes want to put some characters back on the input stream, for further processing. That is all what we shall need, but it is also possible to define and use tables, and to use states -- thus, we can program finite automata. I had first tried to put everything (removing of spaces and line breaking rules) into a single OTP. But it is much easier to write and debug if it is decomposed into sevral small OTPs. When one types a japanese text, spurious spaces may appear, for instance, carriage returns may be inserted: they should not add spaces to the text. We can first try to remove all the spaces. We shall consider the following characters as spaces to be removed (if I have forgotten some, tell me). We do not remove the ideographic space U+3000. This will work. You may fear that this will prevent Omega from distinguishing paragraphs, which are separated by a blank line, i.e., by spaces, but this OTP is called after the text has been broken in paragraphs. Yet, if latin characters appear inside japanese text, we may be removing too many spaces. We shall therefore remove only the spaces that are before or after an asian character. We shall consider the following character ranges as asian (there is a coarser decomposition of the Unicode chart, between an A-zone (alphabetic, 0000-33FF) and an I-zone (ideographic, 3400-9FFD), see http://czyborra.com/unicode/characters.html , but hiragana, katakana and asian punctuation also lies in the A-zone: we have to be more precise). And the rest as non-asian. I do not understand why these are 3-byte characters, I do not know what to do with them, and I will therefore simply forget them (I hope it is OK, if not, tell me). According to Ken Lunde's book, "CJKV Information Processing" (actually, the library only has an older edition, entitled "Japanese Information Processing", but guess this part hasn't changed much), there are three classes of characters before or after which line breaking is forbidden. To break lines, we shall insert commands between any two characters that will either allow or prevent line breaking. These macros are defined as follows. Furthermore, some characters (such as 。(full stop) or 」 (closing quotes)) are allowed to protrude in the right margin. We shall implement this with the following macro. => #(\1) "\CJKunbreakablekernone \CJKprotrude "
We shall change the hyphenation parameters in the following way. \adjdemerits=0 % Was 10000 % Is is a good value? We therefore need to redefine the \chapter and \part commands, to add text before and after the part or chapter name. The \today command should be redefined to print the date in japanese. The following code is adapted from jbook.cls (which also treats the case of vertical writing, in which case the numerals have to be written in kanji -- I removed this part). In the above example, we defined macros \西暦 and \和暦 to select how the date should be typeset. But they do not work, because Omega does not consider these characters as letters: the cannot appear inside control sequences. To allow their use in macro names, we have to change their catcodes. As there are several thousand catcodes to change, and as they should be set one by one, we shall write a small Perl script to do the job. The same goes with the paragraph indentation, that ought to be an integer multiple of the character width (unless you explicitely use the ideographic space for this purpose, in which case the indentation should be zero). Things get more complicated with the multicol package. First, typeset the text vertically. All the text should be vertical (RTR, in Omega parlance), except page headers and footers (we shall first assume that there are no floats nor footnotes). Second, there is a font problem: most characters remain unchanged, but some have to be turned (parentheses, quotes, long vowel mark) or moved (full stop, comma, small kana). There do exist vertical fonts, but I do not have one. Third, I do not know if Omega is really able to do that (yet). The documentation for Omega 1.12 (the only documented version) says that it is not done yet; I am using version 1.15; the latest version is 1.23. It may be wiser to wait until things stabilize.